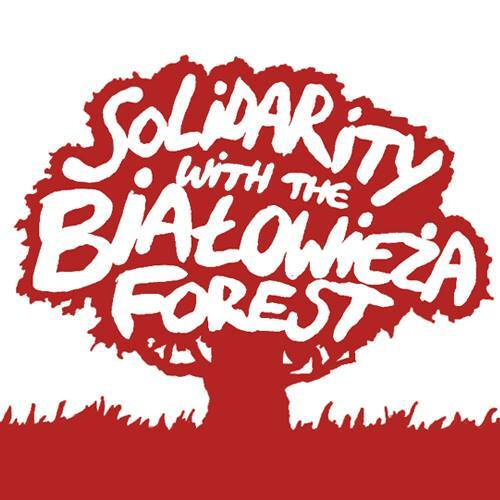 Stand in solidarity with the Bialowieza Forest! The unique Bialowieza Forest in Poland is under attack. Bialowieza Forest is one of the last remaining parts of a vast, primeval forest that once spread throughout the European Plain. It is home to many rare and endangered species of animals and plants including the European Bison, the last of its kind. Heavy logging machine led by the State Forests – a corporation which manages forests in Poland – is turning this beautiful wilderness into a depressing felling site. The last forest giants: oaks, hornbeams, and spruces are falling. Today, like never before, this Forest needs your support! We must stand one by one to save the nature of this place – to protect the uniqueness of the Forest for itself, for our children and grandchildren. Forest destroyers, who have broken international agreements and devastated the UNESCO world heritage site, cannot take a step further! Join people protesting all the time in the Bialowieza Forest, a contact person from Pracownia: Barbara Ewa Wojtaszek. Find her on facebook or call +48 501 477 213. Change your profile picture to *this photo* and upload it on Facebook. Spread the word: post this information on your social media or send it via email to as many people as you can. Organise a solidarity action in your country. A photo-op in front of a Polish embassy would be perfect! Remember to send us the photos (diana@pracownia.org.pl) or upload them to our event on Facebook. To stop the mass cutting which is crucial during the breeding season of birds such as the Three-pines Woodpecker (Picoides tridactylus) – one of the rarest and most precious species. To inform the public opinion about the situation and resist the manipulation and anti-wildlife propaganda of the Polish Ministry of the Environment. To keep fighting for making the entire wilderness of the Bialowieza Forest a National Park (a long-term goal), so that no future government of Poland will have any possibility of further logging. Almost 20 years ago we made efforts to fully protect the Bialowieza Forest – the last remaining lowland natural forest which is unique in Poland and Europe. It is also a Natura 2000 site, a world biosphere reserve and a UNESCO Heritage Site. Thanks to our efforts in 1996 the Białowieża National Park's area was doubled – it was increased to 10,502 ha by connecting the part of the area of two neighboring forest districts – and a 3224 ha buffer zone was created around the park. In 2011 we managed to further strengthened the protection of this ecosystem by establishing a protection zone around the Białowieża National Park which eliminated disturbance caused by hunting in the buffer zone. Finally in 2012, as a result of cooperation in a broad coalition of NGOs, we managed to reduce the cutting of trees to a level that did not disturb the balance in the Forest and allowed local needs for timber to be met thus preventing conflictions with the local community. At the same time commercial forest management was prohibited in 100-year-old or older tree stands that were not human-planted. What we are witnessing now in the Bialowieza Forest is overexploitation on an unprecedented scale, an unsustainable forestry economy of Jan Szyszko - the Minister for Environment in the populist Polish government. State-owned Forest Company supported by the Ministry is cutting hundreds of trees under the pretext of fighting bark beetles (which are in fact natural and vital element of this ecosystem! ), breaking international regulations and a moratorium on centennial trees. Between January and May 2017 over 10 000 trees have been cut down in the over-100-years-old parts of the Forest. A recently issued legal ban on entering major parts of the Forest serves as a pretext to hide the intensified logging from public opinion. It also allows to fine anyone who breaks this controversial regulation and directly hits the local tourist industry. As a member of the coalition of 7 Polish environmental organizations we sent a complaint to the European Commission which then launched the procedure against the Polish government. This means that the Commission considered the arguments of the Polish Ministry of the Environment as invalid and upheld the view that an increased logging in the Bialowieza Forest violates Community law. To stop the mass cutting which is crucial during the breeding season of birds such as the Three-toed Woodpecker (Picoides tridactylus)- one of the rarest and most precious species. Direct actions to stop harvesters - heavy machines literally breaking trees as matches - and to slow down this autrageous deforestation. Spreading unbiased information across the whole country and abroad – informing the public opinion that this government and Minister for Environment are damaging the UNESCO heritage site, are breaching the law and international regulations and act against the citizens of today and generations to come – by mass and social media etc. Arrange at least two accompanying events in Poland, probably in the capital city with the participation of celebrities, artists and scientists. Solidarity actions in the biggest Polish cities, such as pickets at the regional directorates of State Forests – happening now! It is the breeding season, we literally must save the birds, especially those of endangered species which nest in trees that are being cut down. The European Commission is contemporary discussing the case and it has the power to impose severe penalties on the Polish government which may help to stop cutting and minimize losses in nature.